Humor and games have a fickle relationship, perhaps it's due to some incompatibility of the timing necessary for joke delivery and the basic nature of an interactive medium. Maybe the long form nature of most video games just makes it hard to keep it consistently funny. Hell, are game developers just overall a not very funny lot? Whatever the reason, this makes truly funny games a bit of a rarity, but a few titles do manage to break the mold. The Escapist staff pooled up a few of their favorites here. 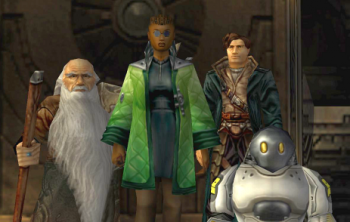 A classic sci-fi RPG that gets overshadowed and forgotten among Ion Storm's more popular or infamous work, like Deus Ex or Daikatana. What could have just been another drab setting of stereotypical characters was instead infused with offbeat humor. One of the character's special abilities is to talk people to death and another is a planet shrunk down to human level. Also, the Totally Arbitrary Collectible Objects, or TACOs, scattered across the game world, and an entire sequence riffing on the Battle of Endor where you help a bunch of scared-shitless stormtroopers battle against cannibalistic ewoks. It's a shame that the game never got the sequel it deserved. For those that don't remember, Borderlands wasn't originally infused with the style that we now all know it for. While you can see traces of assets and designs in the original art and trailers, it's the inclusion of color and laughs that really put the game on the map. 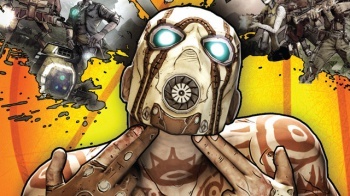 It was a bit of a white washing over the original title, but Gearbox really came into its own with Borderlands 2. Goofy dialogue, over-the-top villains, and plenty of explosive slapstick humor make this a fun little retreat for shooter fans.